A while back, I posted a list of restaurants that had failed to impress me over on my Facebook page, some of which I'd written up, and a few that I hadn't bothered with. I asked which of them was worthy of a second chance. El Gallo Giro (my review is here) was the overwhelming winner, but nobody named a dish that was worth going back to try. Bodacious Pig came in second place, and since I love good barbecue and I'd only visited the place once when they had first opened, I figured why not? Recently, my roommate came down with a nasty bug. I think we all have our go-to things when we're sick, and when I'm stuffed up I crave Chinese hot mustard or wasabi. My roommate craves spicy Mexican food. Eagle, charming town though it may be, isn't exactly rife with options in this regard, which doesn't matter much since Casa Mexico is her favorite anyway. I offered to go get take-out for her, but since I'd just had Mexican for lunch I wasn't particularly into the idea of eating there myself. 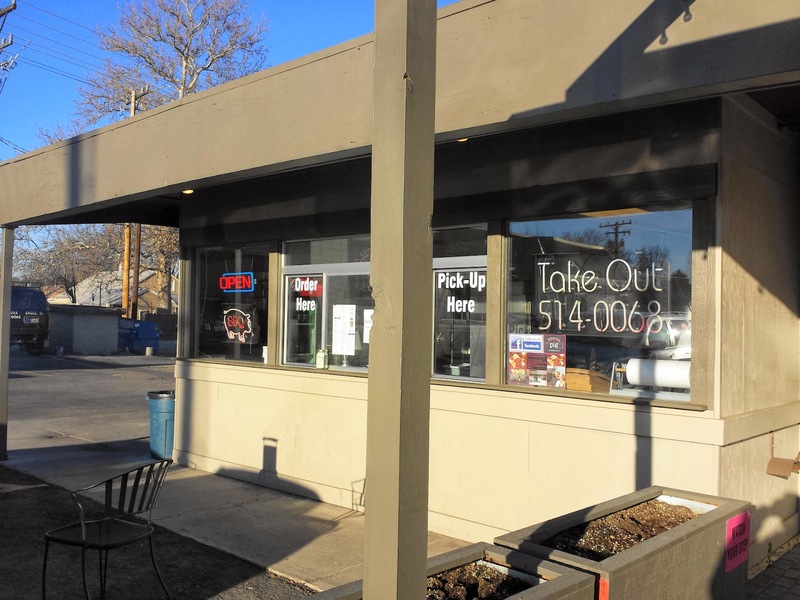 I decided to hit up Bodacious Pig, since they're the only barbecue joint in Eagle (before you argue, Bob's Texas BBQ is just outside the city limits) and have a nifty little take-out window. The first time I had visited them, I kind of went all out and ordered the three meat combo plate (sausage, pulled pork and ribs). My feeling at the time was that they put too much emphasis on their sauce and not enough on getting flavor into the meat itself, and it was an expensive letdown. This time, I decided to play it safe and just order the pulled pork plate, since it's my favorite barbecue item (if not my favorite food, period). I chose potato salad and mac-n-cheese for my sides, even though it added another buck-fifty to my order (the only sides that you can get at no extra cost are beans, slaw or fries). While I waited outside the window, I did my best to avoid their little patio fire pit, which had mostly burned down to embers and was billowing substantial amounts of irritating smoke. Luckily, the nature of the cuisine means that it's pretty much made in advance and held, so it was only a few minutes before they passed my heavy foam take-out container out the window. 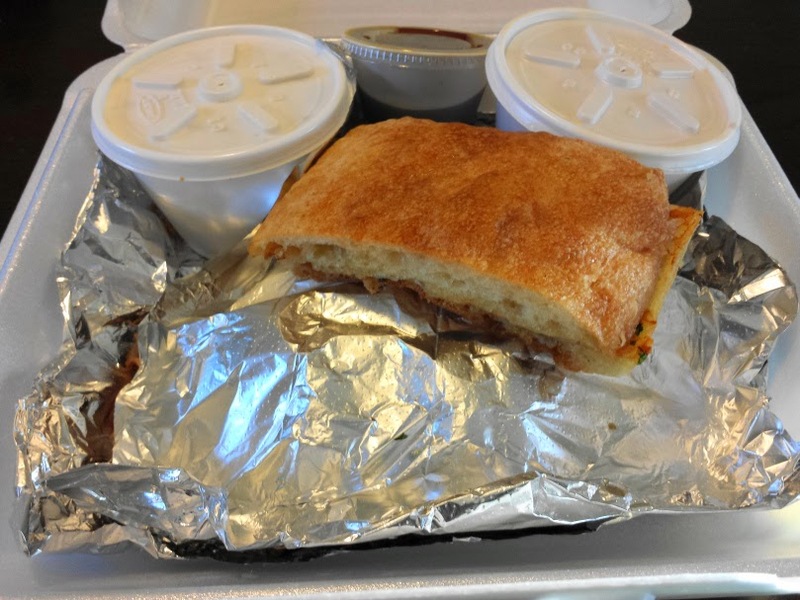 One thing I have to give Bodacious Pig points for is the fact that, rather than a roll or a slice of white bread, you get two pieces of garlic bread with your order. It can get a little floppy in transit due to the steam inside the container, but nothing's perfect. Unfortunately, it was the best part of the meal. The trend of under-seasoned side dishes I've been dealing with lately continued here. 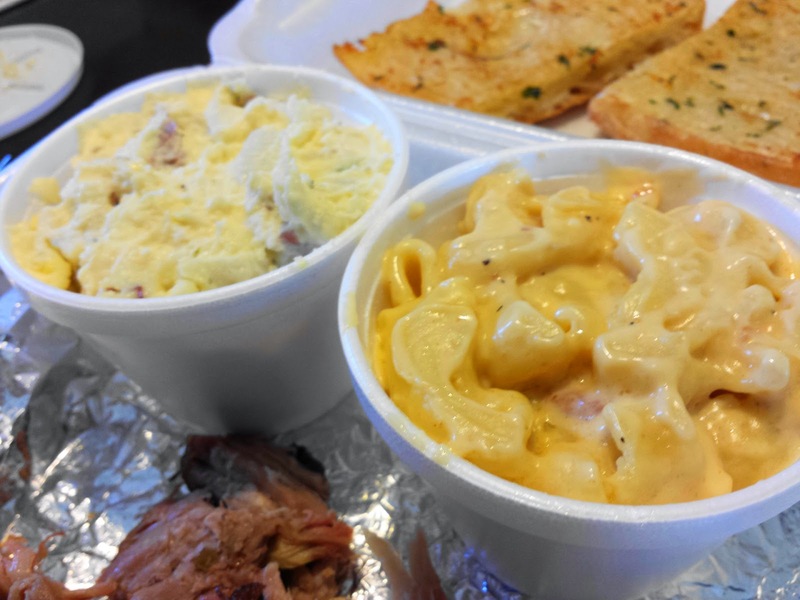 Both the potato salad and mac-n-cheese were cooked perfectly, which is surprising considering how huge the macaroni noodles were, but both lacked flavor, despite the addition of bacon to the latter. Luckily I was at home and salt and pepper were available, but it's just not the same as when they're cooked into the dish. 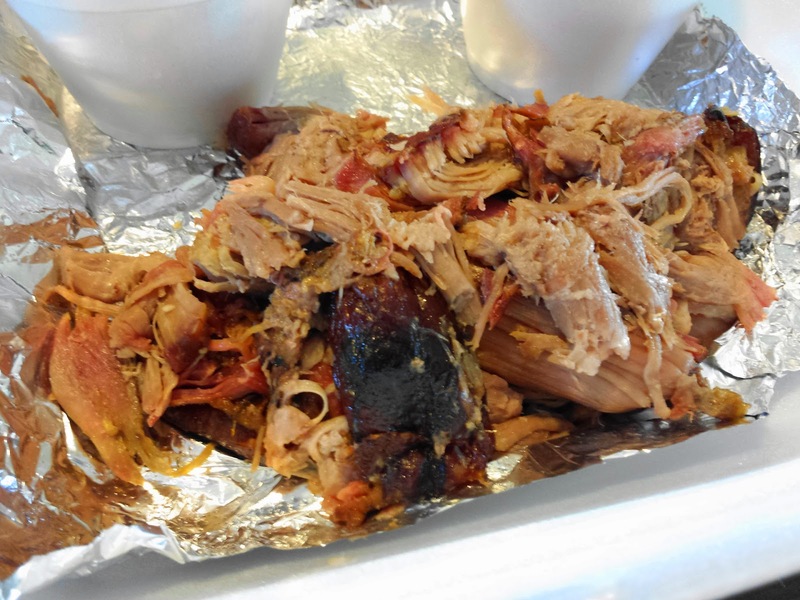 The meal comes with half a pound of pork that the menu describes as "smoked fourteen hours, hand pulled, served with mouth watering molasses hogwash". I was given a good selection of dark bits, light bits, and bark, but there weren't a lot of textural differences in them. There also wasn't a lot of flavor, which is amazing for meat that's been smoked for fourteen hours. My clothes were smokier from standing by that fire pit for five minutes. Seriously, I'm not being clever here. I've never had "hogwash" before so I don't know if what they serve is a good example of it or not. It was a thin, slightly sweet sauce that resembled a light soy sauce in color and consistency, and didn't bring much to the proceedings other than a little welcome moisture. The saving grace was their barbecue sauce, which has a very good flavor. I wish I had taken the extra when they offered, which is a little sad since sauce should be used to accent or offset the flavor of what it's applied to, not as a necessary element to imbue flavor. Well, it would have been the saving grace were it not for the bone chips. Thanks to a little overzealous butchery, I found two shards mixed into the meat, one relatively large one that was hidden in a little pork pocket, and another which was small and rather sharp that I was lucky enough to catch with my teeth as soon as I bit down, otherwise I likely would have lacerated the inside of my mouth with it. The moral of the story is that I'm learning more and more to trust my first impressions. Even if I don't like a place the first time I go, sometimes I'll have a feeling that I may have just chosen a bad dish or that the place is having an off night, and I'll keep them on my to-do list. I can't think of a time that I wanted to just write a place off and then had my mind changed by a follow-up visit. Food: Lacking in flavor and a little bony at times. Maybe the tri-tip is better? Value: Generous portions, but it doesn't matter unless you want to eat it. Service: Friendly and competent enough for the thirty seconds I dealt with them. Atmosphere: It looks like it's pretty cozy inside, I wouldn't eat at their little parking lot patio though.